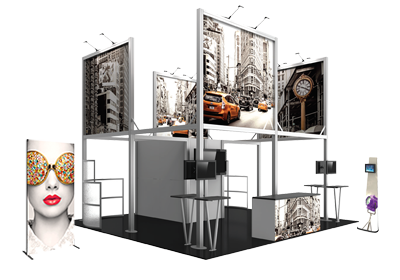 Hybrid Pro™ Modular Kit 02 is an off-the-shelf 10ft x 10ft display kit that creates a stunning display solution. Kit 02 features a monitor mount, literature racks, back wall tables and LED display lighting, combined with durable aluminum frames and high quality graphics. Customize with additional elements to create a truly remarkable display that leaves a lasting impact.